We now do inbuilt controls up to 135kW! Manufactured from 0.9mm galvanised sheet steel to match specified spiral ductwork requirements. Available from 100mm to 500mm diameter. Manufactured from 1.2 mm galvanised steel and designed to be mounted for installation into existing ductwork. Manufactured from 1.2 mm galvanised steel with plain (standard) or mez flanges. The duct section is designed to enable the terminal box and element bank to be easily removed for inspection and maintenance. We can supply a range of spare parts and extras as needed. AAH Products manufactures a range of electric duct heaters which provide a reliable and cost effective source of heating. We supply standard circular duct heaters typically within 48 hours for orders placed online. We have developed a new, more energy-efficient controller using the latest technology. Our controller uses a self-tuning algorithm which minimises the energy required to maintain the required temperature. If the heater is used in conjunction with a room temperature sensor, the system achieves the maximum possible efficiency. 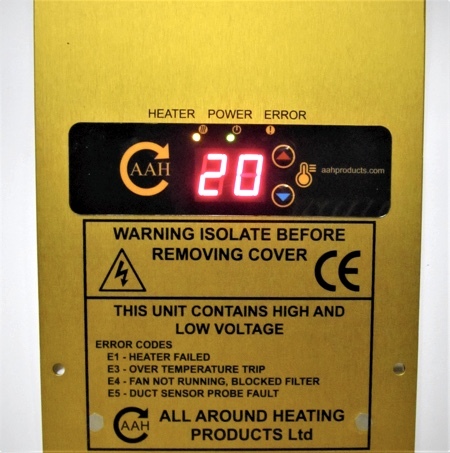 Our heaters can be supplied with or without controls. BMS 0-10 volt signal option on all controls. Large discounts given to bulk purchases! Our Duct Heaters have an LED Display that reads room temperature if using our RS1 room sensor. This makes it more energy efficient and accurate.